RUSH: Oh, man, folks, this was great. This was awesome. The president was in the Oval Orifice having a meeting with the president of Egypt. They let the media in there during all these ceremonial, “Hey, Prez. How you doing?” there by the fireplace, and the press started asking questions, and the president went off on immigration. We are working on the audio sound bites even now. He went off on it! He went off on the court system. He went off on the Democrats in Congress. He said the Democrats in Congress are a terrible thing. You know, I wanted him to highlight immigration this week. I said yesterday, this is the week to go for it, this is the week to bring it home, this is the week to hammer it — and, man, it looked like he was gonna do it based on what I just saw a little bit of it during the break. The press cannot even get another question in. He’s not letting them ask about anything. He just said during this little session that it was Obama who was putting kids in cages. Thank goodness he did this! It wasn’t Trump that started this. This was the Obama administration, the ACLU, the Flores arrangement from the Ninth Circuit Court of Appeals. Trump said that Obama separated children because it was federal law. This is the thing the Drive-Bys conveniently leave out. It was federal law. Obama had no problem with it. Trump reminded people he fixed it! He issued an executive order to stop the separations, which a court struck down. Does anybody remember this? He responded, ’cause the news was that Melania was terribly distressed by the photos, by the pictures of separated children in cages. So the president issues this executive order ending separations, and a judge struck it down because it was against the law. The law is families get separated. So many people demanding amnesty — not amnesty, asylum — that this is what happened. He was really ticked off. He looked… You know, sometimes Trump seems jokingly angry or mildly irritated. 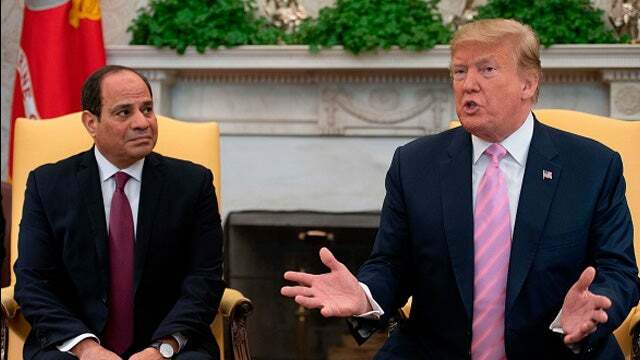 RUSH: Here are the sound bites from the Trumpster in the Oval Office, a meeting with the Egyptian president, Abdel Fattah el-Sisi. Trump was speaking with the press. It’s what happens. They gather in there in the Oval Office next to the fireplace. It’s tradition. The guest sits as the camera is looking at the fireplace on the left side. Trump sits on the right side. THE PRESIDENT: I never said I’m cleaning house. I don’t know who came up with that expression. We have a lot of great people over there. We have bad laws. We have a judge that just ruled, incredibly, that he doesn’t want people staying in Mexico. Figure that one out. Nobody can believe these decisions we’re getting from the Ninth Circuit. It’s a disgrace. You have a Democrat Congress that’s obstructing. You talk about obstruction? The greatest obstruction anyone’s ever seen. All they have to do is spend 20 minutes and they can fix this whole problem. We’re bucking a court system that never, ever rules for us, and we’re bucking really bad things with Congress, with the Democrats in Congress not willing to act. 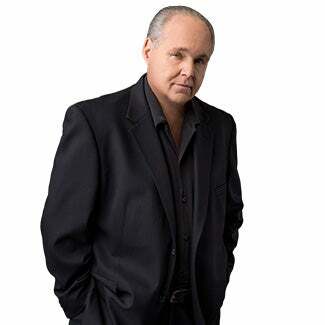 RUSH: He’s doing what the experts in Washington think is nuts. He’s keeping a campaign promise! There are stories (I have them in the Stack today) that Trump is holding himself back, that Trump is paralyzing himself, that Trump is making all kinds of mistakes because he’s actually trying to keep campaign promises. Who does this? (I’ll grab one out of the Stack at some point just to back myself up here. But do not doubt me on this.) But I love the gloves coming off here. We have judge’s ruling that the executive leader of the country can’t exercise his constitutional duties. This is left-wing obstructionism, and these things have to wind their way up to the Supreme Court where these courts eventually will be overturned. So Trump is trying to keep a campaign promise. He’s doing what he can on the border, and he’s finding all this obstruction which he says is the greatest obstruction anyone’s ever seen happen. I love that. You know, it’s a speech technique. When you play golf with Trump, the golf course you’re playing (if it’s one of his) is the greatest golf course you’ve ever seen and everybody’s jealous of it. “Is this not the greatest hole you’ve ever seen? Is that not the greatest sand trap?” It’s a speech pattern that he’s got. It’s a personality quirk, and you just smile, you just laugh. When you are with Trump, you know what to take seriously and what not to, and it’s harmless. It’s the greatest obstruction anyone’s ever seen, greatest wall anyone’s ever seen, the greatest Air Force One any country’s ever gonna have. “These judges, all they have to do is spend 20 minutes…” By the way, this thing at the border now — and this is starting to be discussed, and it’s about time. You know, our illegal immigration laws such as they are — and they do exist, but they’re not being enforced uniformly. They were not written to handle this mass exodus of things like caravans and coyotes and trucks and trainloads full of people. As such, the detention centers, detainment centers that we have constructed to handle the illegal arrivals are flooded, and there is no more room. Nobody! Despite the amount of aid we send, despite the amount of tourism that these countries have, nobody can stay there. It’s not what’s go on. This is an organized migration. It is an organized effort to flood the United States’ southern border. As I said yesterday, it’s kind of a derivative of the old Cloward-Piven plan to destroy the United States as founded. You know, the basic element of Cloward-Piven… These were two professors at Columbia University, leftists to be sure. We’re $22 trillion in debt. But these are the designs of left-wing intellectuals who think this country’s unjust, illegitimate, immoral, and this is one of the ways they came up with to destroy America. And I think we are living in the midst of an international effort. It’s gotta be paid for by somebody. This takes a lot of money, to support this number of human beings on this long a trek. I mean, they don’t get American welfare before they got her. They got getting it somewhere. Mexico’s not giving them any money that we know of. So we’re way beyond the confines here of simply the trickle in comparison of illegal immigration. 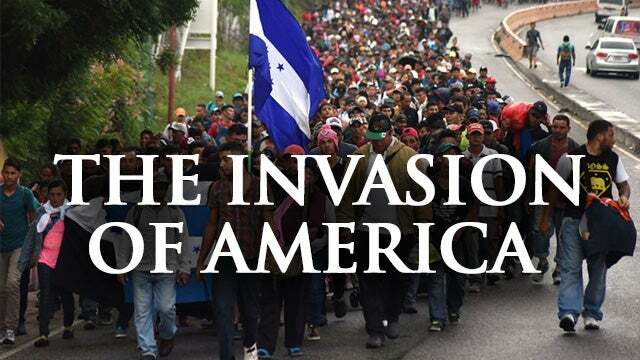 This is a mass-migration invasion that is no doubt planned and orchestrated to coincide with a Republican presidential administration. The president later on in his meeting here at the Oval Office then, as I mentioned to you, just nuked, just nuked the Democrats and the media on this whole idea that he is separating parents from their children. THE PRESIDENT: Obama separated the children, by the way. 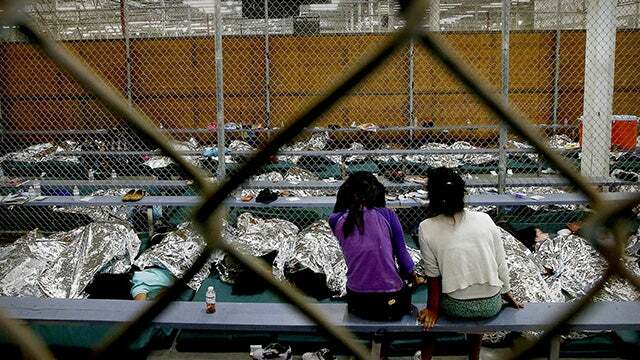 THE PRESIDENT: Just so you understand, President Obama separated the children. Those cages that were shown? I think they were very inappropriate. They were built by President Obama’s administration, not by Trump. President Obama had child separation. Take a look. The press knows it, you know it, we all know it. I’m the one that stopped it. President Obama had child separation. Now, I’ll tell you something. Once you don’t have it, that’s why you see many more people coming. They’re coming like it’s a picnic, because let’s go to Disneyland. We are not looking to do it. But President Obama had the law. We changed the law. RUSH: He’s exactly right about this. Separation of families, especially those seeking asylum, is the law. It’s the famous Flores decision, but it’s even more deep than that. Seeking asylum requires the adults separated from the kids because there is detention required (minimum three weeks) during an asylum hearing. Now, the asylum system is overrun. It’s no longer able to be done in three weeks. So the kids are sent to detention centers. But they’re not put in cages! Anyway, the media dregs up these pictures from prior to the Trump administration of children being separated. This is a trick the media’s been doing. The publish pictures of mistreatment of illegal immigrants from the Obama years, posing them as current pictures during the Trump administration. Indeed, there were some kids in what looked like cages behind bars and so forth. “Look what Trump is doing!.” So Melania gets upset about this, and Trump issues an executive order saying no more separation. He’s the guy that tried to stop it. A federal judge ruled that Trump’s executive order is unconstitutional ’cause it was in violation of the law! The law requires this! It’s another… Not one reporter, not a single reporter in the White House press corps is even remotely interested in telling the truth about this. Not one! Not a single reporter. All of this stuff traces back to Obama. All of it happened prior to Obama. There is nothing new here. What’s new is that somebody’s trying to stop it, and that is what has people upset. RUSH: Now, I gotta tell you. This just frosts me. James Clapper is on CNN right now claiming that Trump told border agents to defy the law and to block migrants from coming in. James Clapper ought to be among the people undergoing charges and, if found guilty, sent off to prison. James Clapper was a willing participant in a silent coup, a phony, nonexistent investigation designed to overthrow the election results of 2016. And here he is with freedom and impunity all over CNN claiming that Trump is breaking the law, that Trump told border agents to defy the law and block migrants. If the president of this country wants to shut down immigration, he can do it, and the law specifies he can. It just takes an executive order, can do it in 20 minutes. And the minute Trump started talking about doing it, here came the catcalls about all the damage to the economy. People started squawking and screaming about, “It will cost the economy a billion and a half dollars a day, minimum.” What about the damage it is doing to the overall fabric of our society and culture, not to mention the fact that that is its intended purpose! This is why this frosts me. McCabe’s out there selling his book, doing signings, claiming that his book’s got the evidence of collusion in it and so forth, when there isn’t any and wasn’t any, and now Clapper saying that Trump is breaking the law.